Are you looking for a Brooklyn Lawyer, Queens Lawyer, Bronx Lawyer or New York City Lawyer who speaks your language, Spanish or English? At Hernandez & Paulonis, we understand searching for attorneys who speak your language, literally and figuratively, is a stressful event. We do not turn cases over to paralegals or receptionists. Instead, we speak with our clients directly, reducing their anxieties by reducing the confusion of the legal system to simple terms clients understand. We Speak in the Language clients are most comfortable. Hablamos Espanol y Ingles. The attorneys of Hernandez & Paulonis, do not limit themselves as either a Brooklyn Attorney, Queens Attorney, Bronx Attorney or New York City Attorney. We are "Lawyers in Service to Our Community", located in the heart of Times Square, licensed to practice in New York, New Jersey and United States District Courts in the Eastern District, Southern District and Western District of New York. We go wherever our clients are in need. This means that no matter what your legal issue may be or where it may take you, we can be there for you! Hernandez & Paulonis represents everyday people. Guiding our work is the philosophy that our technical skills are useful not as an end in themselves but as a means to promote justice, equity, and peace. We believe that our clients deserve our best efforts, our full creativity, and complete information about the matters we undertake on their behalf. Whether you suffered a serious personal injury from an accident or medical malpractice and find yourself hospital or homebound, lost a loved one in an accident involving wrongful death or have been arrested for driving while intoxicated (DWI), we work with you and your family, walking you through every step of the way. From a bedside or jailhouse visit to the courtroom, through negotiations and at trial, we take the time to explain what is happening in terms you will understand. We also handle immigration law matters (visas, citizenship) wage and hour law matters (unpaid minimum wage and unpaid overtime), as well as divorce and family law concerns, such as equitable distribution, child support, child custody and visitation. We respect the right of our clients to make their own judgments, and we view our role as informing those judgments by providing an array of options and discussing the advantages, disadvantages, and consequences of each. Our goals are both to help our clients accomplish a useful outcome and to leave them with an enhanced ability to make strategic and tactical judgments. 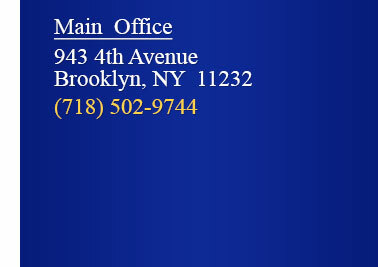 So whether you are looking for a Brooklyn Attorney, Queens Attorney, Bronx Attorney, a New York City Attorney or just an attorney who understands the legal complexity and personal consequences of your legal problem whatever it may be, call Hernandez & Paulonis. Regardless of the legal issue you face, contact us to discuss your situation. We are here to walk your through your legal issue with appropriate solutions immediately!